The Street is building in available seat kilometer (capacity) 33-35 per cent lower for the current fiscal year than it had in FY18. ET Intelligence Group: Markets are usually unforgiving to stocks of companies that do not repay loans, mismanage operations, and fail to take concrete steps to remain operationally viable. Against this tradition, Jet Airways has turned out to be quite an exception. Despite question marks on the very survival of the airline for at least six months, its stock has actually gained 2.3 per cent in the past two weeks and market capitalisation remains around Rs 3,000 crore. So, why has Jet’s stock failed to mirror its protracted existential troubles? The answer, perhaps, lies in the lenders’ response to its financing needs and the Street’s interpretation of the funding deal. In 2012, when Kingfisher Airlines was beset with the same set of troubles, the carrier’s market capitalisation eroded 75 per cent. 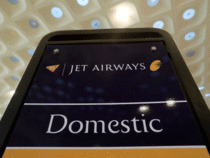 In case of Jet Airways, its stock fell 10 per cent in six months before lenders announced on March 25 the proposal to convert debt into equity. Since March 25, the stock has gained 2.3 per cent. In fact, on a one-year forward basis, Jet’s stock is trading at just a 23 per cent discount to the shares of marketleader IndiGo. This indicates there is considerable disconnect between the markets’ perception and the airline’s underlying fundamentals, which have worsened to an almost irretrievable extent. Jet’s operating fleet size has dwindled to just 7-8 aircraft from 120 planes, and companies leasing planes to the struggling carrier have taken them back. The biggest factor undergirding the airline’s stock price is the assumption that lenders converted their debt to 11.2 crore new shares at a hypothetical conversion price of Rs 250 per share. The Street seemed to have assumed that at a hypothetical price of Rs 250 a share, the lenders could have written off Rs 2,800 crore of the airline’s debt. Hence, the Street believes that the airline’s present market price is fair. Also, the funding of Rs 1,500 crore from lenders is insufficient to change the airline’s fortune. To date, it is not known how much of the airline’s debt has been written off in lieu of equity. The Street is building in available seat kilometer (capacity) 33-35 per cent lower for the current fiscal year than it had in FY18. This is relatively better than Jet’s present state of operations where it is flying only seven planes. In the inter creditor agreement framework, the lenders plan to operate with just 26 aircraft. This means that the Street has already factored in some crucial negatives to a certain extent. Jet has accumulated losses of Rs 2,700 crore in the first-nine month of FY19. Lenders have been circumspect on giving temporary credit to the airline, given the vulnerable state of its operations. Potential suitors are likely to explore investing in Jet when its lenders might have to agree to a 100 per cent haircut given the airline’s high accumulated losses, other payable liabilities and bloated costs. Otherwise, the whole exercise of seeking an investor in Jet Airways may meet the same fate as Air India’s. But traders with a short-term view on the industry have found reasonable opportunities to buy and sell the Jet scrip that has seen scant institutional participation. In the past one year, delivery percentage of trades in Jet has been less than 11 per cent, while the Nifty’s delivery percentage is around 36 per cent. This shows that day-traders have moved into the space perhaps vacated by long-term investors.